Delta Tau has introduced its latest low cost CNC and general purpose controller that enables simpler and inexpensive operation of all sorts of machines from metal cutting tools to lasers, flatbed cutters and Cartesian robots. The control provides motion control, operator interface, PLCs, standard interfaces and software in a single unit. Called the Advantage 500, this system can handle four or eight axes and has at its heart Delta Tau’s powerful Turbo PMAC Clipper which gives motion controllers stability, flexibility, accuracy and speed. These features coupled with the use of the Turbo PMAC CPU embedded computer, delivers a controller that has many high level features within an otherwise simple system. Unlike PC based solutions the Advantage 500 solves all of the wiring headaches of getting cabling in and out of the motion controller. Furthermore the controller comes with a broad array of hardware interfaces as standard so that just about anything can be simply plugged into the unit. This means requirements such as lead screw and planar compensation; backlash compensation; fast position capture; rapid position comparison; master/slave capabilities; and the ability to handle 40MHz and auxiliary handwheel encoders; these are just a few of the features available that will greatly appeal to machine builders and end users. The set up is simple and could not be easier to operate. There are interactive input screens, which include axis characteristics, axis I/O, axis reference methodology as well as general axis and CNC options. The Advantage 500 can be supplied with either CNC machine tool software or with DNC software or custom HMI’s designed using VB.net or C++ embedded for any type of flatbed machine. The CNC interface uses the familiar RS274 G-code library, but also offers the PMAC-style structured text entry and a DNC interface for external program download. Most usefully the controller’s CNC software has full G, M and T code compatibility for milling, turning and grinding. The designers at Delta Tau’s have implemented their soft PLC, which allows the Advantage 500 to be programmed using American Ladder Logic or Sequential Function Chart since the software is IEC1131/3 compliant. Programming can also be performed remotely for subsequent download. The user-friendly programming is emulated at the controller itself, but while allowing the changing of variable values for maintenance purposes, the programs cannot be overwritten at the machine. This is clearly an important safety and security feature. 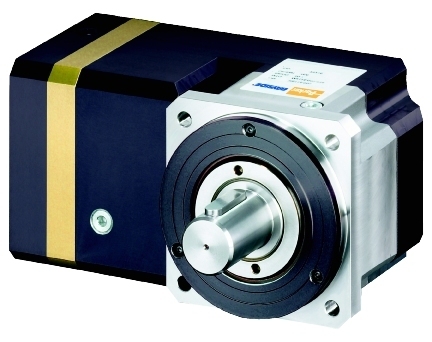 Deliveries of the AKM Synchronous servomotors from Kollmorgen are now down to only four weeks lead time due to capacity being increased by one third. In spite of considerable growth of the AKM range, the factory has reduced its lead times and thus is able to help its customers to realise additional competitive benefits. Machine builders can now deliver faster, and machine users will benefit from shorter service times. Many motor users will already be aware of delivery problems from their current supplier who right now will be experiencing very long lead times. In fact some motion control manufacturers have warned their customers of these delays and feedback from many is telling us that motor lead times are rising to 20 to 24 weeks. Kollmorgen’s extra production capacity at their AKM motor manufacturing factory has resulted in considerable growth, but even with this higher production demand the added manufacturing capacity has still enabled them to reduce motor delivery time to 4 weeks. As machine makers, if you are experiencing severe problems producing machines ordered from your company, then Micromech can help keep production going and avoid any penalty costs. To assist in the motor and drive conversion process we have a checklist of questions to make it easier for customers wanting to change to Kollmorgen products. At Micromech we offer a complete service, from design and build, to test, programming, installation and commissioning which means we can fully integrate an alternative motor and if it is required also the drive. This means changeover to AKM is made easy. Not only are AKM motors suitable for the development of compact, light machines with improved heat dissipation, energy consumption, durability; they are also a sensible alternative to many motors used in already existing applications. Thanks to their extraordinary multiplicity of design options and special design characteristics, a suitable solution can be found quickly and cost-effectively for almost all circumstances and providing positive results for the existing machines. Micromech is a leading UK motion expert in positioning and speed control supplying a wide range of motion control products plus associated equipment to industry, research, defence and manufacturing. Micromech can supply goods either as components or complete packages and so is a significant force in the field of sophisticated multi-axis control and is a recognised specialist in servo and stepping motor applications. We are pleased to announce that Micromech are now a Certified IPC/WHMA-A-620 application specialist. This follows successful completion of an IPC approved training course by Dave Whitmell our Workshop Supervisor. The IPC 620 standard covers the requirements and acceptance for cable and wire harness assemblies. The training topics included crimp terminations, insulation displacement connections, connectorisation, moulding and potting. This investment in the IPC 620 certification demonstrates Micromech’s continual commitment to meeting customer requirements and quality improvement. The IPC/WHMA-A-620 certification is the first industry consensus standard for cable and wire harness fabrication and installation. Classes of products are defined and include criteria for target, acceptable, process Indicator and defect conditions to support the collection of visual quality acceptability requirements for each class. Revision A, developed during a four-year process by members from user and supplier companies, represents a consensus among industry leaders which includes the IPC Wire Harness Acceptability Task Group of the Product Assurance Committee and the Wire Harness Manufacturers’ Association Industry Technical Guidelines Committee to prepare this standard. includes training, certification and instructional materials and also takes the individual to the position whereby they themselves are at a level to be IPC/WHMA-A-620 Certified IPC trainers. It is a comprehensive and technically accurate programme providing certified IPC trainers with high quality materials and detailed instructional plans. The benefit of this certification demonstrates commitment to customer requirements and greatly facilitates certification to ISO Certification or other quality assurance initiatives. By having earned this portable credential, Micromech has received immediate recognition, legitimacy and value throughout the electronics industry. Modern medical engineering incorporates a wide range of devices for various areas of the logistical challenges of mobilising patients, and highly complex systems for diagnosis and treatment purposes, as well as to automate laboratory processes. We are therefore pleased to announce that Thomson linear motion components are now available from Micromech offering clear advantages in all medical engineering areas. Depending on their intended purpose, linear components used in a variety of medical engineering must feature an extensive range of different and sometimes competitive performance characteristics. For Instance, which linear motion components are used in a dentist’s chair, for example? In order to support the weight of a patient plus a safety reserve, the components used must first and foremost be extremely robust. In addition, all movements must be performed as smoothly and quietly as possible to ensure patients are not subject to any unnecessary stress. Compact dimensions are another key factor, since the chair, with all its added special accessories, must not take up too much space. For diagnosis systems, for example a combination of movable patient table and the scanning heads of a MRI tomograph, another important criterion must be taken into consideration and that is the need for precision. These highly technical imaging procedures can only deliver accurate results if the patient is moved precisely into the desired position and the scanning heads are aligned with equal precision. Precision is of utmost importance in automated laboratory systems such as pumps that take blood samples or inject dosed quantities of active ingredients to the milligram by means of infusion. It is also the case that it is often only those miniaturised components, which meet stringent sterility and corrosion resistance criteria that can be installed in these types of device. 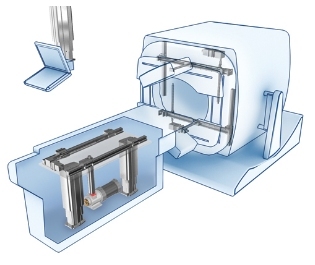 Linear motion components used in handling systems for laboratory techniques – where DNA tests are performed, and cell cultures are incubated or drugs are manufactured – must be equally precise and efficient. Their tasks must also be performed without the need for frequent interruption for maintenance. robotic workstations; DNA sampling; cell culture; air displacement; pipetting; drug testing; drug dispensing; precision liquid dispensing; blood sampling; infusion pumps; adhesive automation; liquid handling; ambulance gurneys and cots; stair lifts; bed lifts; patient couches and tables; bath lifts; surgical tables; dental chairs; MRI and CT machine; nuclear machine; portable thermal imaging; O-arm image diagnostic; radiation oncology; portable ventilator; dental injectors; portable respirators; surgical robotics; pick and place; and blood handling/sampling – to name but a few. The Stealth Advanced RS right angle planetary gearhead delivers the high performance features of the STEALTH RS in a compact, right angle package. With seven frame sizes and 9 gear ratios to choose from, customers are guaranteed to find a gearhead to fit most stepper and servo motor applications. The RS designs have a great space-saving advantage over other brands of precision right-angled gear reducers in that the dimension between gearbox mounting face and the rear of the body shell is very short per gearhead size. For example the RS60 unit has a dimension of only 76.8mm which is only 23% greater than it is square flange footprint. This allows the drive motor to be tucked down out of the way very neatly so there is reduced risk of it being hit by passing operators or moving machines. The superior design and construction deliver the helical advantage because they are strong; with 30% more torque and quiet with less than 70db noise. The RS is fast, accepting 6,000 RPM input speeds, accurate at less than 4arc minutes backlash and furthermore is over 94% efficient. Neat and compact, the seven frame sizes range from 60 through to 300, the nine ratios from 5:1 up to 100:1 and nominal output torques range from 5 to 100Nm. The price includes the adapter flange and the input coupling selected to suit the specified motor type. The RS has an excellent service life of 20,000hours, can operate at temperatures from -20 to 90° C and has a positive degree of protection rated at IP65. The application opportunities for the Stealth range is enormous but of course its stepper and servo motion where high dynamic and precision control is required they excel.